In my introduction to WordPacks, I explained that I like to learn words in "groups" because it's easier, quicker ... and creates patterns that I'm more likely to notice in future. One of the first words people learn in Mandarin is nǐ hǎo (你好) which means hello - although literally it means "you good". Let's build off this. I'll create a small WordPack today (the type with words that have the same endings) using: hǎo. These ones are quick to learn, especially if you already know the Mandarin words for 'speak', 'look', etc. To 'speak good' - or 'to agree'. Makes sense. Now memorise it. To 'look good' - 'optimisic'. Wow, this is so easy. If something is 'exact good', it's 'just in time; or 'just enough'. Are you loving WordPacks yet? This one is 'luck good' - being 'lucky' or 'fortunate'. These words are taken from the HSK beginner list which end in hǎo. If you have any other words which end in hǎo that you use relatively often, then leave a comment below. 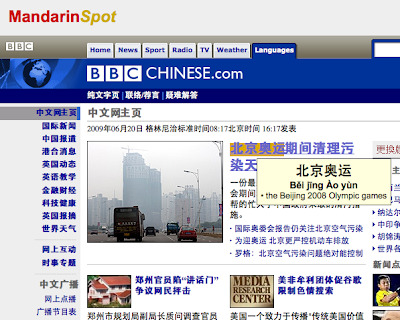 Summary: If you're looking for a website to annotate Chinese text, I recommend (and yes, I use) MandarinSpot. And every time you come across a word that you don't know, you copy & paste it into a web dictionary, and then move on. But that's a painful process - especially if you're a beginner and you're pretty much looking up every word. To speed that up, you can use annotation websites. Basically, you load the Chinese text through the annotation site. However, when you now hover your mouse over a word or a phrase, a little popup tells you how to pronounce it in pinyin, and what it means. 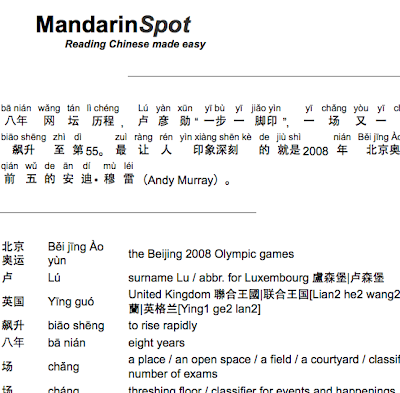 MandarinSpot allows you to enter web addresses, or to paste Chinese text - either of which get annotated. And at one point I had problems where it was giving me cached versions of one particular page, so I emailed MandarinSpot - and Alex replied, did some tinkering, and it worked. So they feel more 'personal' to me. When someone says "thank you" (xiè xie)(谢谢), in English we usually say "don't mention it" or "you're welcome". A common reply in Mandarin is "bù kè qi" (不客气), which basically means "no need to be polite". There are a number of other words which begin with "guest" (kè)(客), and the whole point of WordPacks is that it makes it easier to memorise words, understand words, and use words. Once you've decided to learn Chinese (and see my article on why I specifically chose Mandarin, as opposed to Cantonese), you actually have to begin somewhere. There are so many options out there (online courses, podcasts, books & CD programs, Skype tuition ...) so let's start with a finite (and very clear) set of steps. By the way, I'm not writing about how others should start to learn Mandarin. I'm talking specifically to you. In the beginning, Chinese is actually a very easy language to learn - no conjugation, tenses also don't change the verbs, nouns don't have genders, the same subject-verb-object structure as English, and simple sentence structures . Of course, it does get more complicated, but you should be able to learn survival Chinese very quickly. If you're a very serious student, my assumption is that you're going to register at a school for regular classes, with an expectation of several hours a week of classes and homework. If so, your teacher will tell you what books you need, and what program to follow ... and this post is not for you. This post is for people who will start off with self-study, and may choose to focus on free but effective materials available on the Net. In other words, this post is just for you. The sooner you begin, the better. Now seems like a perfect time. Create a study habit. Don't study on & off, whenever you feel inspired. Create a study habit. Learn regularly. It's better to do just 20 minutes a day (which is what I did), than 2 hours once a week. Focus on relevant stuff. Learn material you will use often, in day-to-day situations. If you're more likely to use the word "dinner" than "ice-skating", then learn the word for dinner. Honestly. Stay focused on learning Chinese. People have complex ideas about learning languages, like trying to set you up with one-year-at-a-time study plans, building libraries for flashcard software, etc. You can waste time later. For now - keep it simple. Don't overdo it in the beginning. If you're self-studying, then you need to be self-motivated. Attempting to memorise hundreds of words and phrases in the beginning might speed you along, but if it wears you out, then you might quit quite early on. Be intelligent about the time you spend learning. When it comes down to memorising lots of words, use WordPacks, for example, to get more done more quickly - with best retention. Read some articles about Mandarin, tones, Chinese culture, etc. Step 1. Cover the Basics. It contains about 3 hours of free material, with a booklet for downloading. Get it on your music player, and listen to it often. When I began, all I did was listen to Conversation 1 from Lesson 1 - over and over again. I didn't try to memorise it. I didn't try work out the tones. I just listened, and repeated. No effort. After about a dozen times, I realised that the phrases were just popping out of my mouth - no effort. Then I moved to Conversation 2. Then Lesson 2. I kept returning the to beginning, going over those basics often. If you have limited time and thus make no effort to memorise the material, but just listen repeatedly (while creating a daily learning habit) then it might take you a few months to internalise those 3 hours of material. If you have more free time, and you take an active learning approach of studying and memorising (rather than just listening and listening), you can truly have taken in those lessons in a few weeks. Step 2. Subscribe to an ongoing audio program. Once you've been through the above course, and you have a good study habit going, then you need to subscribe to a podcast that teaches Chinese. I recommend ChinesePod, which is great for both teaching Mandarin as well as for maintaining my interest, but you might prefer Chinese Learn Online, or Popup Chinese, or some other program. The reason for getting a subscription (which is generally free for beginners) is you need to keep getting fresh material. If it hadn't been for ChinesePod, I would have got bored right at the beginning, and never made it this far. Also, learn how to use an online dictionary. My favourite is MDBG.net. For example, can you work out what the Chinese word is for "orange juice"? And what is it that I can do, if I say "Wo hui xie zhong wen"? And if you saw this word on a sign - 酒 - what does it mean? Take a read through About.com's intro page to Mandarin - you'll get some really good material there too. You're going to have to memorise vocab, so get over it. But be smart about how you do it. Use WordPacks, so that you learn with maximum efficiency. Choose phrases that you will use every day - like "Do you want something to drink? ", "Dinner is ready", "Let's go", "Good morning everyone", "Where are my keys?" and of course "Kiss me again." Try to learn 1-5 words a day. Make this a habit. Don't just read 1-5 new words a day, actually memorise them. And revise regularly. Don't get carried away with too many - just create the habit, and build up from there. Buy yourself a small paper dictionary - and learn how to use it. Step 4. Get a Language Partner. In the beginning it might just be someone who can answer your simple questions. You might then progress to someone that you can have basic communications with (in pinyin) using email or instant messaging. Build up to having conversations with them. If you live in China, then it should be easy enough to meet someone. If not, are there any Chinese people you work with, who would be happy to meet up with you and talk Chinese? And if you want to widen your net, there are plenty of sites where Chinese people make themselves available as language study partners (they help you with Chinese, you help them with English) - like Hello China, China Club or ForeignCN. Don't do too much too soon. There is a concept called "gym blues" - where people go to gym for the first time, work out too hard, get really sore, and end up not going back. Don't do this here - start off slowly, establish a study habit, and then build up from there. Don't get too theoretical. You might not understand why saying sorry in Mandarin is basically the phrase "bad meaning" - get over it. Learn the phrase, use the phrase. Later, try work out why. With Chinese it's so easy to get caught up in the etymology of a single word, where in the same time you could have learned a dozen words. And don't spend too much postulating - time talking about learning, setting up study schedules, planning where you'd like to be when, choosing optimal strategies for learning ... just learn. Just follow the above steps, and let me know how you're doing. We know that people are using Google to search for how to learn Chinese, and Google Trends is a useful for comparing these searches over time. Below you can see what happens if we examine the trends in relation to searches for the following three phrases: "learn chinese", "learn mandarin", "learn cantonese". Clearly "learn Chinese" is the most popular, and indeed searches for Mandarin specifically are more than double the searches for Cantonese. In general the trend is downwards, and other than an impressive spike around the time of the Beijing Olympics, it has continued to fall. I've tried various other searches in relation to learning Chinese, but none of them were as interesting as the above. If you can think if any other good searches, leave a comment below. This post is an introduction to what I call "WordPacks" - explaining what they are, and why I use them. 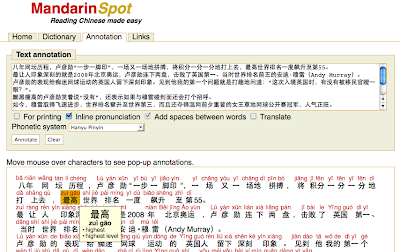 Through use of WordPacks, your Mandarin study can be made more efficient and more focused. There are different of types of WordPacks, and I have no interest in attempting to accurately categorise them. I mention a few types with the intention of creating frameworks in your mind that will allow you to start to see patterns yourself in what you're learning. perfume, shampoo, tap water, saliva, glue, lemonade, sexual secretions, tears? You wouldn't - not if you were starting with English. But if you knew that all the words took the form "X shuǐ" [X 水] (where shuǐ means 'water'), then you've already done most of the work. Some of them are really obvious, like perfume which is "xiāng shuǐ" [香水] mearning "fragrant water". (It's the same "xiāng" as in the Mandarin word for Hong Kong, literally meaning "fragrant harbour".) Others you may have to just memorise, like salary being "xīn shuǐ" [薪水]. With a little extra effort, you can learn 5-10 words in the time it takes to learn 2-3 independent words, and with a higher retention. We can do exactly the same by looking at words which start with the same character. 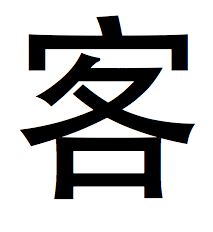 In this case we consider 真 (zhēn, meaning 'true' or 'real'). WordPacks needn't only be constructed on the basis of the characters which make up words - but can be based on parts which make up the character. This is of particular interest to people who are learning to read & write Chinese. You're basically adding one stroke at a time (two, in the last case) - and if you know the build-up of the character, you'll sometimes find overlaps in meaning (as we see above), you'll be less likely to confuse two similar-looking characters, and again your learning will be more efficient because you're learning in "packs". Again, three words with less effort than memorising three independent words. A radical is where a character is embedded into another character, generally affecting the meaning of that character. You can find a radical index here. So for example, whereas 女 (nǚ) stands alone to mean woman or female, it can be added to other characters as a 'radical' as we see in the following examples: 妊 (rèn, to conceive or be pregnant); 奶 (nǎi, meaning milk or breast). In both cases, you can see the link between the meaning of 女 and the meaning of the words which include the 女-radical. Clearly, creating WordPacks on the basis of words which share the same radicals can make it much easier to remember. The following characters are all pronounced exactly the same (including tones). It might be easier to learn these words together (you only have one pronunciation to learn! 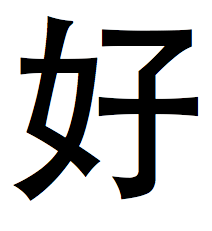 ), but it might also be useful in avoiding confusion when you hear someone say shì. It's useful to group words like this, but obviously not as easy as using the other types of WordPacks. So my recommendation is to try learn in "packs" - and in coming posts I'll be doing some of the work by offering you WordPacks, so make sure you're subscribed. For those who missed the announcent, the Chinese government will be issuing a series of official changes to the "simplified" written system where it has been over-simplified. There's plenty of debate as to whether they're heading back to the "Traditional" system. You can read more about this in The Economist.